In terms of reliability, revolvers have long been a superior means of self protection due to their limited range of malfunctions compared to modern semi-automatic pistols. 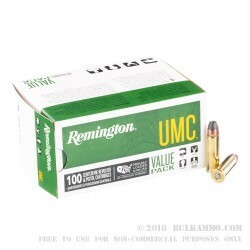 WIth the introduction of the Remington 125gr .38 Special Semi Jacketed Hollow Point, you will be hard pressed to find a more lethal, more reliable combination anywhere in the world today. 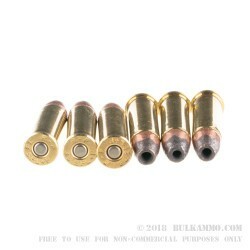 The 125gr semi jacketed hollow point round is engineered for rapid expansion, as the exposed, soft lead core beyond the forwardt tip of the copper jacket expands violently upon impact as it is compressed against both the target, and rearward against the copper jacket. The +P chamber pressures provide increased velocity and stopping power that are capable of rivaling even standard .357 magnum rounds. At an average muzzle velocity of 945 feet per second, the Remington 125gr .38 Special SJHP is one of the most lethal, and hardest hitting .38 rounds anywhere on the range today. 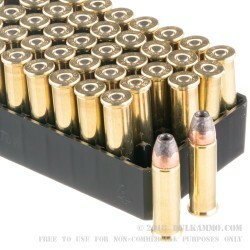 Self defense shooters looking for a performance self defense ammunition as reliable as their revolvers, well be well pleased with the the Remington 125gr .38 Special SJHP. Bravo, BulkAmmo. In 4 business days, from order to doorstep. Already familiar with this ammo. Thanks again. Q: Is this ammo 38 plus P .. Picture shows + P however info does not relate this detail.